The one doing the creating is the one who is learning! As creators ourselves (especially of GIFs, videos, comics, infocomics), we know how much learning goes on for the one doing the creating. We are advocates for involving students as creators to prepare them for a rapidly changing future where creativity, problem solving, and innovation will be indispensable. 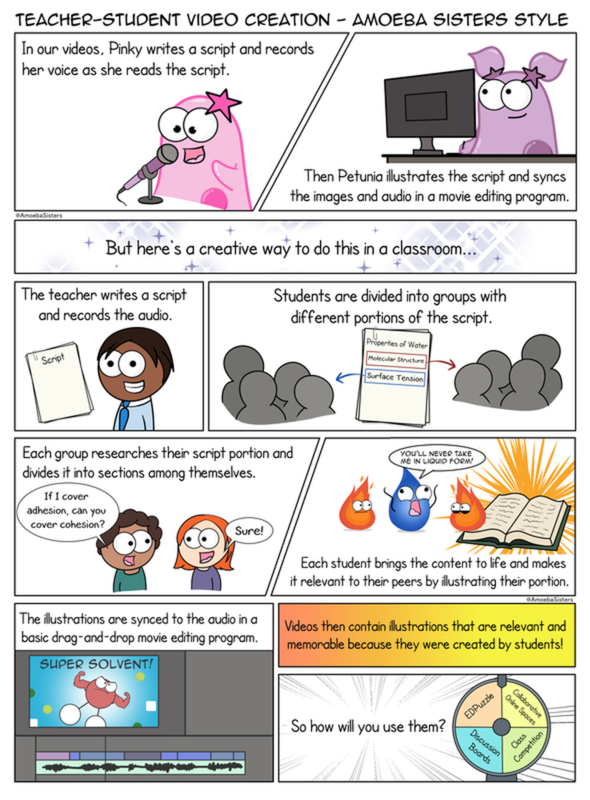 On this page, you will find some ideas and tips for involving students as creators of videos, GIFs, and misconception comics. 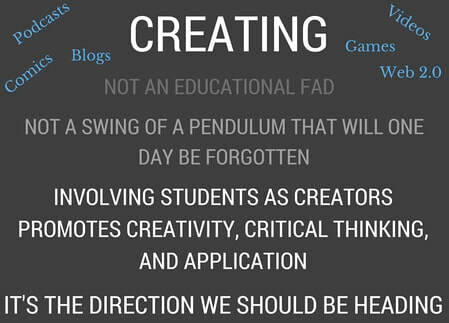 But these are only just a few ways students can create! We love to connect with others who want to see creations that make it out of the classroom doors! Our social media buttons are below. We outline 5 steps (shown below) for our video creation in a collaborative teacher-student style. We are not affiliated with tools we list in these steps. If we mention them, we liked their ability to work with student video creation, and they were free at the time we used them. We go through our video creation steps, and other creation ideas, in many of our presentations. I notice you animate some portions of your videos. What tool do you use to animate? Our videos are mostly a series of comics timed to audio, but sometimes they contain minor animations. We do not use a fancy animation program. We create an image, save it, reopen it to make a slight change (such an image rotation or position change), save the new image, and repeat--- and we eventually end with a series of images that can appear animated once they are all put into a movie editing program in order. Interested in trying this out? We suggest naming your images numerically as shown below to put into the movie editing program. What tools do you currently use to create your videos? Here are the tools we currently use to create our videos! We are often experimenting so we update this when needed. ​As an alternative, you can actually use images that you created and turn them into a GIF! GIFs are frequent on social media, but they can be great visual representations of educational content! Check out the GIFs that we make as an example- you will find they are powerful for animating a science process or bringing vocab to life! GIFs can be created by students even if technology is limited---students can draw the images by hand and a smartphone can be used to take pictures of the images to make them digital. All you have to do with your images is put them in a free GIF maker (such as GIF Toaster for iPhone/iPads or gifmaker.me as a web based tool). Here are some of our tips for involving students as educational GIF creators! Petunia demonstrated the creation of this quick GIF in <5 minutes in one of our trainings. This comic example is addressing a misconception often seen in life science regarding cellular respiration and photosynthesis. Use data to determine misconceptions and- instead of reteaching- consider asking for the help of students to create a comic to address the misconception! Students know how to make content relevant to their peers, and they have fantastic ideas on addressing misconceptions. This also gives the creating a significant purpose: it's helping their peers! The most important thing to remember about creating is to just begin. You can't grow and get better without beginning. We encourage you to look at our old original homeostasis video (from 2013). Petunia had no drawing background, and Pinky recorded off her cell phone with no plan written out. Compare that old video with our more recent homeostasis video. We only improved with practice and a desire to grow ourselves. We are still learning. Keep at it. The world needs more creators after all. Click button above to see our milestones. In our presentations, we are passionate about promoting students as creators and not just consumers. Our idea for a student creation showcase organized by curriculum standards had made it to the finalist round along with nine other ideas submitted by other educators. ​We continue to look for ways to support student creation. Each topic in our new Unlectured Series includes ideas for involving students as creators with the content.